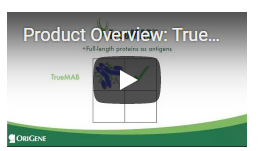 TrueMAB™ are OriGene developed and branded mouse monoclonal antibodies. These antibodies were all generated by using human cell produced full length human proteins as immunogens. In comparison to peptide-derived antibodies, TrueMAB™ antibodies provide higher sensitivity and specificity for the recognition of native epitopes appeared on the protein conformational structures. They are great tools for immunoassays that are sensitive to proteins’ conformations, such as immunofluorescence, immunoprecipitation, immunohistochemistry, flow cytometry, ELISA, antibody arrays and more. Positive Controls for WB Available - A positive control is available at nomimal cost for Every TrueMAB™ antibody if applicable, which is the HEK293 over-expression lysate of the target protein. This lysate can serve as the positive control in Western blot.